Whats Castros new way of changing Cuba, is it for the better or worse? 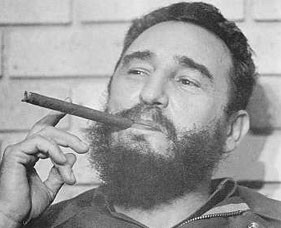 Fidel was born in Aug. 13, 1926, his father was a wealthy sugar cane farmer. Castro was highly liked in school and gained respect fast. When he got to college he excelled in athletic and very intelligent. After his graduation in late 1945, Castro entered law school at the University of Havana and became immersed in the political climate of Cuban nationalism, anti-imperialism and socialism. In 1947 Castro became passionate for the social justice and went to Dominican Republic to over throw Trujillo. In 1948 Castro married a wealthy woman named, Mirta Diaz Balart, and they had their first child together named Fidelito. I Castro, want you to know that I want to make our country better, I make these changes I have with the USA for reasons. The Soviets are more into the fair trading business, with our country. Our country does a lot for other countries who need us and right now we need to make our own country free. The missels are ment for safety for us, The USA looks at it as an attack, when its just for our own safety when they tried to attack us when we cut off he trade wit them and went to the Soviets. Don't look at the changes as if they were all bad. I am doing it for the better good.